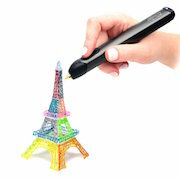 The 3Doodler is a could best be described as a "Freehand 3D Printer." Using standard 3D printer filament, it allows you to "draw" in space. Great for adding finishing touches on your 3D print, or sketching 3D structures.